As a part of the Warhammer 40k Unit Cards attempt, I will need to take some nice photos of my models. The best way to do so is using a background that matches the way they are based. I went out to Home Depot and bought a 2" x 2" piece of plywood. 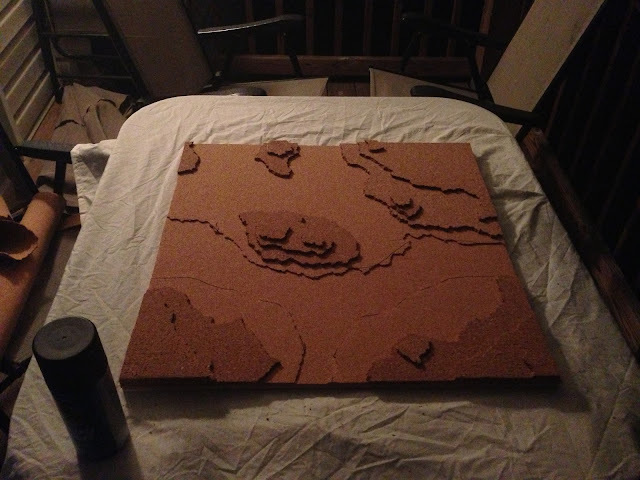 I then got a crap ton of cork and start tearing and gluing. The technique exactly matches the bases I use for my army. I'm hoping they will blend in pretty well once the army is painted. The T shape cutout with the board edges front, left and right will be a road of sorts and I'll put two little Tau houses in the background. I'm working on those also, but no pictures yet. My local store is having a Halloween Terrain competition and I'm going to put little pumpkins outside the Tau houses and paint up models from different armies that will be little Shas'saals (Fire Warrior Cadets) out for trick or treating. On a directly related note, my hands hurt like Horus himself stomped on them right now. I think it's from dealing with all the pressing on the cork and spray painting. I put on some Icy Hot, but all that's doing is making me smell bad. Without further ado, here is the board in progress. It has been sprayed black also, but that photo is pretty lame to look at.